The key to Costa Rica’s climate is its nearness to the equator. This proximity has two overriding consequences: first, it means that like all tropical countries, Costa Rica has wet and dry seasons; and second, it means temperatures in most places are pretty much the same year round. The wet or “green” season, as locals call it, runs from May to November and is characterized by lush foliage, afternoon thunderstorms, and impassable conditions on some of the country’s unpaved roads. 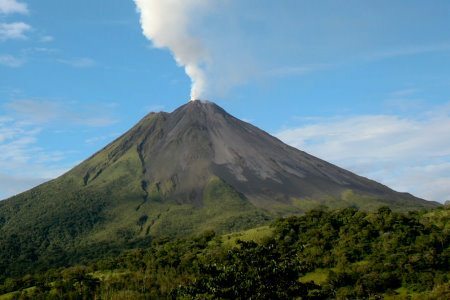 The dry season, by contrast, extends from December to April and coincides with the peak tourist times, as many North Americans take advantage of the Christmas holidays to escape to Costa Rica’s warm beaches and cloud forests. In certain areas, however—notably the Caribbean coast—you can count on rain year round. Generally speaking, temperatures in Costa Rica vary with the elevation. Coastal cities like Puerto Limón, Puntarenas, and Nicoya remain in the 80's more or less non-stop, while San José, at 3,800 feet, enjoys a kind of eternal spring, with its 70-odd degrees providing welcome relief from the extremes of the tropical climate. At higher elevations, it can get cool at night. Average monthly temperatures (°F) and rainfall (inches) for select locations in Costa Rica are shown below.